The Sun moves into the sign of Aquarius on January 21 in 2018. This post will be a character reference to those with this Sun sign and also for those with an ascendant of Aquarius. There are a few differences between the Ascendant in Aquarius and the Sun in Aquarius, the main difference being that the Ascendant (for all signs) is our expression to the world, which can include our appearance. Our Sun sign is our expression but this expression comes from internally, our true core self. Those that do not know us well may not recognize the inner person. The Sun is also more closely tied to our goals and aspirations. Keep this in mind when reading this highlight on Aquarius. This information will also apply but to a much lesser degree if your Sun is located in the eleventh house, which is naturally ruled by Aquarius. There is something that is unique, even unconventional, about the character of an Aquarian. This can be expressed in the way these individuals dress, especially those with Aquarius rising but above all else, it is expressed in their definition of character. Many Aquarius individuals appear to be rather aloof in their behaviour. They march to the beat of their own drum and are quite comfortable with this, at least as they age. In early life they may have realized their differentness and may not have felt comfortable in their skin as with most young individuals. Many Aquarians have a difficult time expressing their emotional side unless of course there are other moderating aspects within the birth chart, particularly aspects to the Moon or the sign of the Moon. If the Moon is in one of the water signs, the emotional side of these individuals might be more out in the open, although not so much if in the sign of Scorpio. Aquarius individuals will focus their attention towards humanity as a whole and are deeply concerned in moving people out of their complacency into the light of a new self-expression. Aquarians can be rather eccentric in their mannerisms, are open to new and interesting concepts although not easily swayed by popular opinion. These individuals would rather walk the road never travelled than follow others blindly. Aquarians are open hearted, open minded and expressive when they are speaking or listening to something that holds their interest. Astrology is right up their alley as well as scientific exploration, modern technology and anything that could be considered forward thinking. They are intellectuals who prefer to use their mental capabilities in problem solving rather than gut instinct, although some are intuitive and meditative. Aquarius is the sign of the water bearer, meaning that they pour the water of knowledge over the world. They want to contribute in some grand plan to help with the shift taking place in our world. They could also be leaders in this evolutionary new order slowing gaining momentum in society. 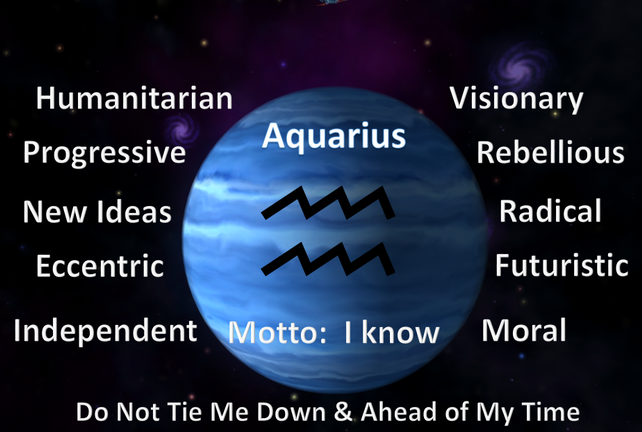 Aquarius is an air sign which suggests intellectual abilities and farsightedness. They are also a fixed sign suggesting that they can be opinionated and not easily swayed. They are, however, curious and learning anything that could be considered different in some way attracts their attention. It has been said that equality and fairness are the hallmarks of this sign and they do not focus on race, religion or colour. 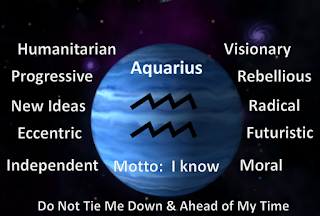 To an Aquarian, we are all equal and we all walk this road of life as one.